High quality, yet inexpensive custom Full Color Luggage Tag in bulk, custom imprinted in full color. Straps are included and shipped separately (add $0.15 per unit to have the straps assembled to the luggage tags). We also supply blank (not personalized) bulk Full Color Luggage Tags: see the Price Table below. Free artwork design! American clients pay no taxes. The unit prices below include your full-color custom imprint on one side. We also supply blank (not custom imprinted) Luggage Tags, Items DPLTM24 or DPLTM3R for $1.09 each and blank bulk Luggage Tags, Item DPLTM24 L for $1.19 each. Setup Charge: $50.00 per order; $15.00 on re-orders. Production Time: 7 days; Rush Production of 3 days: add $0.25 per unit. Blank (not custom imprinted) tags ship next day. Please check also our super economy luggage id tags with limited number of imprint colors. Rectangular & Round Luggage Tags with Full Color Digital Imprint. Personal Information Write-on Surface on the back. Clear plastic straps are included and shipped assembled at extra cost (add $0.15 per tag for assembly). 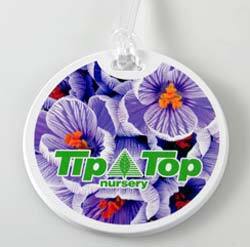 Product Size: 2 1/4" x 4"
Imprint Area: 2" x 3 1/4"
PACKAGING: Luggage tags ship with the straps unassembled -straps in same carton. Add $0.15 per unit to have the straps assembled to the luggage tags. PRODUCTION TIME: 7 days after art approval; Rush 3 day production is available: add $0.25 per luggage tag. Blank items ship next day.